A really nice article in the current Themelios by my brother Eric on how Proverbs guides us into wisdom in how we use our words. Filled with good insight, and urgently relevant for our lives today in the church, especially for leaders. I would like to argue that, in the book of Proverbs, one cannot argue with a fool without making things worse. The wise person instead trusts the Lord to intervene by silencing and stopping foolish speech and vindicating those who trust him. I realize this conclusion may seem extreme. In order to recommend it, this article briefly sketches how the major characters in Proverbs speak and examines how the wise respond (or do not respond) to foolish speech. Then it turns to the NT, focusing on Paul’s directions to how Timothy and Titus should speak in different situations, as well as Paul’s presentation of Christ as the wisdom of God in 1 Cor 1. The essay closes by applying the wise speech of Proverbs to everyday-ministry settings. Why does the fool always have to be right? Why is he always arguing, always putting others in the wrong and justifying himself? Because he does not relish the righteousness that is found in Jesus Christ—the very righteousness of God (Phil 3:10) that God confers on anyone forsaking whatever righteousness they can achieve on their own (3:9). In my experience, some Christians are burdened with a profound a sense of the wrongness of the world and the church, but do not have a correspondingly sweet sense of God’s grace for sinful people. Their strategy for dealing with the pain of this pervasive sense of wrongness is to offload it on others. I have known Christians whose “ministry” was pointing out others’ faults, being suspicious of false teaching in others, criticizing and scrutinizing other Christians, and so on. A Christian can rebuke and exhort in a larger context of grace, but the person I am talking about does not do this—it is a ministry of condemnation, not reconciliation. Today Crossway releases Knowing the Bible, a series of Bible study guides that will cover the whole Bible, Lord willing, in 6 years. Lane Dennis and I conceived the project a few years ago in a desire to provide the church with a theologically robust, gospel-rich, user-friendly, and digitally accessible series of study guides that take readers through any given book of the Bible in 12 units. After asking substantive questions of the text at hand, each of the 12 units identifies the gospel, biblical theology, and systematic theology in the passage. In this way we hope readers come to the end of the study and have a strong grasp of that Bible book--and specifically how that book gives gospel nourishment, develops the big storyline of Scripture, and reinforces orthodox doctrine. J. I. Packer is Theological Editor. Thereafter we plan to ratchet up to 8 volumes a year. Thanks for your support, and I warmly welcome your feedback as this initial batch is released. Here are some endorsements for the series. And in the video below I introduce the series. Knowing the Bible Series from Crossway on Vimeo. An Eternity in Hell? Really? The traditional doctrine of hell seems terrible to our modern ears because it is out of step with our modern intuitions about how God should behave. But our intuitions about these matters are hardly a reliable guide, given what Scripture says about the noetic effects of sin. To put it another way, the fact that an infinite punishment for sin seems an appalling, even disproportionate, punishment to contemporary human beings does not necessarily mean it is an appalling, disproportionate punishment. It may be that this is simply testimony to our failure to take with sufficient seriousness the idea of sinning against a being of infinite beauty and value. Translation: The fact that an eternal hell seems disproportionately cruel as a punishment for sinners--that very sense of disproportion--is itself one manifestation of the sin that deserves eternal punishment. Ah, Sir Launcelot! Thou wert never matched of none earthly knights' hands. Thou wert the meekest man that ever ate in hall among ladies; and thou wert the sternest knight to thy mortal foe that ever put spear in the rest. If Peter and Paul were here, they would scold you because you wish right off to be as accomplished as they. Crawling is something, even if one is unable to walk. Do your best. If you cannot preach an hour, then preach half an hour or a quarter of an hour. Do not try to imitate other people. Center on the shortest and simplest points, which are the very heart of the matter, and leave the rest to God. Look solely to his honor and not to applause. Pray that God will give you a mouth and to your audience ears. I can tell you preaching is not a work of man. Although I am old [he was 48] and experienced, I am afraid every time I have to preach. . . . So pray to God and leave all the rest to him. My life is a witness to vulgar grace—a grace that amazes as it offends. . . . A grace that hikes up the robe and runs breakneck toward the prodigal reeking of sin and wraps him up and decides to throw a party, no ifs, ands, or buts. . . .
It’s not cheap. It’s free, and as such will always be a banana peel for the orthodox foot and a fairy tale for the grown-up sensibility. Some are ready to look on the Old Testament as being, as it were, out of date and as if we in these days of the gospel had but little to do with it; which is a very great mistake, arising from want of observing the nature and design of the Old Testament, which if it was observed it would appear full of the gospel of Christ, and would in an excellent manner illustrate and confirm the glorious doctrines and promises of the New Testament. Those parts of the Old Testament which are commonly looked upon as containing the least divine instruction are, as it were, as mines and treasures of gospel knowledge, and the reason why they are thought to contain so little is because persons do but superficially read them. The treasures that are hid underneath are not observed. In the 1970s, Sam Shoeman was diagnosed with liver cancer and told he had only months to live. A few months after his death, the autopsy revealed the doctors were wrong. He had only one small tumor still contained within the liver--not a life-threatening stage of cancer. Sam Shoeman did not die from liver cancer; he died from believing he was dying of liver cancer. Our beliefs change us mentally, physically, and spiritually. Our brains are constantly in a state of flux; moment by moment new neurons are developing and new circuits are being laid down, new axons and dendrites are forming for the facilitating of new messages to the neurons. At the same time, unused connections are removed, dormant nerve tracks are pruned back and unused neurons are deleted. Incredibly, our beliefs, thoughts, behaviors, and even our diets change our bran structure, ultimately changing who we are. Throughout this book we will explore the amazing ability of our brains to adapt, change, and rewire based on the choices we make, the beliefs we hold, and the God we worship--as different "God-concepts" affect the brain differently. 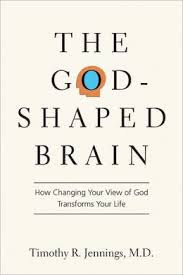 My goal with this book is to reveal God in the clearest way possible, to demonstrate how our belief in God changes us, and to display his methods on a practical level. Phil Campbell offers ten ways to make our preaching clearer (a la Col 4:2). Good stuff for all communicators--in an excellent book by the way. He expounds with a few paragraphs on each in the book. 1. The more you say, the less people will remember. 2. Make the 'big idea' shape everything you say. 3. Choose the shortest, most ordinary words you can. 5. Forget everything your English teacher taught you. 7. Translate narratives into the present tense. 9. People love to hear about people. 10. Work towards your key text. Workers with brawn are prone to despise workers with brain, such as city secretaries and schoolteachers. The soldier boasts that it is hard work to ride in armor and endure heat, frost, dust, and thirst. But I'd like to see a horseman who could sit the whole day and look into a book. It is no great trick to hang two legs over a horse. They say writing is just pushing a feather, but I notice that they hang swords on their hips and feathers in high honor on their hats. Writing occupies not just the fist or the foot while the rest of the body can be singing or jesting, but the whole man. As for schoolteaching, it is so strenuous that no one ought to be bound to it for more than ten years. In 1947 a certain Phyllis Sandeman wrote Lewis asking if it were possible to love a house inordinately. She had been raised in a magnificent home over 600 years old that had just been donated by her brother to the National Trust. I think that about Houses the answer is this. Nothing rises again which has not died. The natural and possessive love for a house if it has been crucified, if it has become disinterested, if it has submitted to sacrifice, will rise again: i.e. the love for a house you were willing to give up will rise again. The willful, grasping love will not--or only rise as a horror. About the house itself, if the love rises, then all that is necessary to bless it will, I believe, be there. It may not be very like what you would now call a 'house': but you'll see then that it was what you really meant by the house. But the whole point is that you can keep forever only what you give up: beginning with the thing it is hardest to give up--one's self. What you grab you lose: what you offer freely and patiently to God or your neighbor, you will have. (Your heavenly library will contain only the books you have given or lent! And the dirty thumb marks on the latter will have turned into beautiful marginal descriptions--I'm joking of course, but to illustrate a serious principle). Never has the church been so able in analyzing its difficulties. The books that come off the presses almost daily give expert analysis and diagnosis. But there is never any solution. We spend the whole time circulating round and round and reasoning and communing and talking together concerning our difficulties, and this has a paralyzing effect. Forgive me for using the following anecdote. It is because of my desire to bring out this point clearly. I shall never forget an incident that happened in my own ministry. “What’s the matter with him?” I asked. “Well,” he said, “I get these headaches. I’m never free from them. I wake up with one in the morning and I can’t sleep too well.” He added that he also suffered from gastric pains, and so on. Again I said, “Tell me the rest of the story.” I am vey glad you are laughing, because you are really laughing at yourselves, as I shall show you. For the final time I said, “Let’s go over it all again.’ And I took him over it step by step. We came to this dramatic afternoon—the thud, the shaking of the submarine. From some friends at Covenant Seminary, an institution worthy of support. What Difference Does the Resurrection Make? from Covenant Theological Seminary on Vimeo. Whenever I read this passage, I am always reminded of the annual assemblies of the great denominations. This is more or less exactly what they all do. Somebody comes forward and reads the statistics, and then they begin to consider the problems. They will probably end by setting up a commission to investigate the cause of their problems. We are experts on the problems and difficulties. I was helped by these words from my brother Gavin. It seems to me that we tend to respond to accurate criticism in one of two ways: repentance or defensiveness. These two reactions are as different as heaven and hell. A defensive heart says, “but look at what I did right!” (diversion). A repentant heart says, “here specifically is what I did wrong” (honesty). A defensive heart says, “but look at what was done to me!” (distraction). A repentant heart says, “here is how I contributed to the conflict” (ownership). A defensive heart says, “it wasn’t that bad” (downplaying). A repentant heart says, “it was a big deal” (admission). Our default mode – in and out of the church – seems to be defensiveness. I know mine is. Nothing is more natural when we feel threatened by a criticism than to divert, distract, and downplay. It's as instinctive as flinching when a punch is coming. In my experience, a heart of repentance is something I have to work at. I have to say things like, “wait a minute. Think this through. Why does this criticism hurt you the way it does? Remember your identity is in Christ. Remember your identity is not at stake. Relax! Is there something you can learn here?” Its a counter-intuitive feeling, like learning to use a muscle we didn’t know we had for the first time. Or better: learning to relax a muscle for the first time that we’ve always kept tight. Its a kind of paradox: an effort at relaxing, a striving to cease striving, a struggle to give up. It makes me think of a man who is standing on trial before a large audience. A long list of (accurate) charges is read. Everyone is watching. And the man responds, “the charges against me are 100% true and fair. I am responsible. No one else is to blame. There is no excuse. And it is a big deal.” A man who is free to be that non-defensive is the happiest and most indestructible man in the world. He has died to himself; his identity comes from something or someone else. He is fearless. This is what the gospel does for us. In the court of God, which matters infinitely more than any human court, we have already been tried, and through Christ we have already been acquitted. Thank you, Jesus. Help us to be so secure in your love that we are fearless to repent. 'For myself,' said Faramir, 'I would see the White Tree in flower again in the courts of the kings, and the Silver Crown return, and Minas Tirith in peace: Minas Anor again as of old, full of light, high and fair, beautiful as a queen among other queens: not a mistress of many slaves, nay, not even a kind mistress of willing slaves. I enjoyed this lecture from Peter Kreeft on joy, drawing mainly from C. S. Lewis and filtering Lewis through an Aristotelian grid. Six reasons from Jonathan Edwards why the elderly should love and long for and celebrate revival, from a brief summer 1741 message to a small private gathering of elderly people. Remember that mid-1741 was the height of the Great Awakening. I'm paraphrasing Edwards. 1. Since they're older, their hearts should be all the better prepared for Christ when he visits his church, having had a lifetime to grow in love for him. 2. Their longer lives means they have more reasons stacked up to see their need for Christ to come in revival. 3. They not only see more reasons in themselves for Christ to fall on the church (#2 above) but also in the church and the world. 4. They are the spiritual dads and moms and grandfathers and grandmothers of other believers and should therefore have a corresponding paternal and maternal concern for the health and life of the church. 5. They've been waiting longer for revival than anyone else. 6. They're going to be dead soon. So they should get used to the presence of Christ here as much as they can. A human being. Living with my dear wife and five delightful offspring in Wheaton, Illinois. Senior VP for Bible Publishing at Crossway. More messed up than this blog will let on. I live (2 Cor 5:15) to delight in (Ps 37:4) and display (1 Tim 1:16) the glory (Rom 15:8-9) of the grace (Eph 1:6) of God in Christ (Col 1:15). Saddle up. "The LORD is my portion," says my soul, "therefore I will hope in him." The LORD is good to those who wait for him, to the soul who seeks him. It is good that one should wait quietly for the salvation of the LORD. It is good for a man that he bear the yoke in his youth. Let him sit alone in silence when it is laid on him; let him put his mouth in the dust--there may yet be hope; let him give his cheek to the one who strikes, and let him be filled with insults. For the LORD will not cast off forever, but, though he cause grief, he will have compassion according to the abundance of his steadfast love; for he does not willingly afflict or grieve the children of men. I read every comment, though I do not respond to every one. Blog commenting is one more avenue in which we can live out gospel-ignited love toward one another. A blog is not a place where we can take a vacation from Christian love; it is a prime opportunity to exercise it. Comment clearly, thoughtfully, briefly, humbly. Obnoxious comments will be deleted. This is my blog, so I determine what crosses the line into being obnoxious. I welcome discussion and even debate, but I will not allow this blog to become a platform for the 'word-wars' against which the New Testament repeatedly warns us.